After a relaxing weekend in Belgium, my cousins drove us to Germany at 200 km/hr while I tried to sleep in the car and imagine I wasn't in imminent danger of a highway accident. 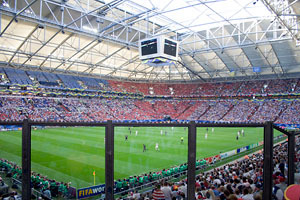 Fortunately, we made it safely and on time for the first US game in the World Cup against the Czech Republic in Gelsenkirchen. There we met up with Lostgal, our friend G who now lives in the Czech Republic, and a few other people. It was totally surreal to see them after so many months, now in Germany and surrounded by a sea of US and Czech Republic fans. I wish we had more time with G, but I am glad we even got to see her for an evening. (And hopefully she will come to visit us in Philly soon?) Lostgal, on the other hand, was with us for a while. We traveled together to Berlin and then to Kaiserslautern for the next US game. I am so jealous of all of her recent travel, and it was great to be a part of it for a week!! So there we were in Gelsenkirchen, a place I had never heard of until the US was scheduled to play a game there. I wish I could tell you something about the place, but I can't even visualize it. From the moment we got onto the train in Essen to go to Gelsenkirchen, all I remember are fans everywhere. I had thought there were a lot of fans at the World Cup four years ago in Korea / Japan, but when we hit Gelsenkirchen I was amazed at how many more fans had come to Europe. It makes sense that there were thousands more European fans here, but I am not exactly sure why there were so many more US fans. It's probably partly because Europe is closer and maybe there are a lot of Americans who are already over here. I also think that people think that Japan is more expensive to get to and travel in, though in our experience that's not actually true. And maybe soccer is getting more popular? I'm really unable to judge because it wasn't until I started dating J that I had any clue about soccer. I hadn't even known that the World Cup had been in the US in 1994! The other thing that amazed me when we hit Gelsenkirchen, and was true for our entire trip, was that Germany wasn't nearly as efficiently prepared for the World Cup as we'd expected. In Korea there were always random buses and extra trains and cordoned off routes, but in Germany we seemed to be mostly piling in with the regular commuters. 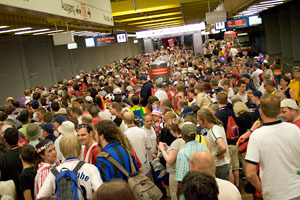 This was the scene at the train station in Gelsenkirchen. We decided to take a bus instead, but then we hit so much traffic in the center of town that all the fans on the buses decided to get out and walk the remaining way (45 minutes) to the stadium. The game itself was not bad, but it was disappointing to lose 0-3 to the Czech Republic. I started to worry that by the next game we'd already be out of the World Cup. Still, it was fun to be there and the fans provided me with constant photo fodder. And the next day we were off to Berlin. Photos are fantastic...really capture the day...and love that you got that station photo before we ran off to the bus. So Mark is from Indonesia?? ?